Some numbers don’t change. These values are deeply connected to the very fabric of the Universe and our human existence. Until they aren’t, of course. Then we change them—for good reason. Scientists around the world just recommended changes to four fundamental constants. The tiny updates are important for the most accurate and precise measurements, but will ultimately allow researchers to base standard units, like the kilogram, on things more reliable than a metal weight. The General Council of Weights and Measures will vote on these updates in November 2018, with the proposal being published in the journal Metrologia. The International System of Units, or SI, still relies on The Grand K—a piece of metal—to define the kilogram. That’s great, except physical things can change over time. Instead, scientists are hoping to update our units such that they’re based on unchanging numbers, the fundamental constants. Doing so, however, requires precise definitions of the fundamental constants. The four numbers are constants most physics students should be familiar with. The first is h, Planck’s constant, a tiny number that relates the energy of the smallest unit of light, the photon, to its frequency, or color. The second is e, the amount of electric charge in a single proton (or -e, the charge of the electron), not to be confused with the number you used in calculus, also called e. The third is k, the Boltzmann constant, used to relate the temperature of a gas particle to its kinetic energy. The final is NA, the Avogadro constant, the number of molecules a substance needs to make it weigh, in grams, the same as a single molecule would weigh in atomic mass units. The researchers came to these values by making increasingly precise measurements, some as recently as this year. They agreed upon values that fall within the margin of error of as many measurements as possible, like trying to put a binder ring through a stack of mostly well-aligned hole-punched looseleaf paper. Sure, the changes will be tiny and (thankfully) won’t require updates to past experimental results. And if you’ve done physics recently, you’ll remember that you usually don’t convert the constant to a number in your answer, you just leave the symbolic representation. But the updates are important. Rather than having to base the constants of the Universe on human-made artifacts, those hoping to make measurements will need to produce standard masses based on the universal constants. “You can communicate these constants with someone on Mars and they’d be able to replicate the kilogram,” said Mohr. 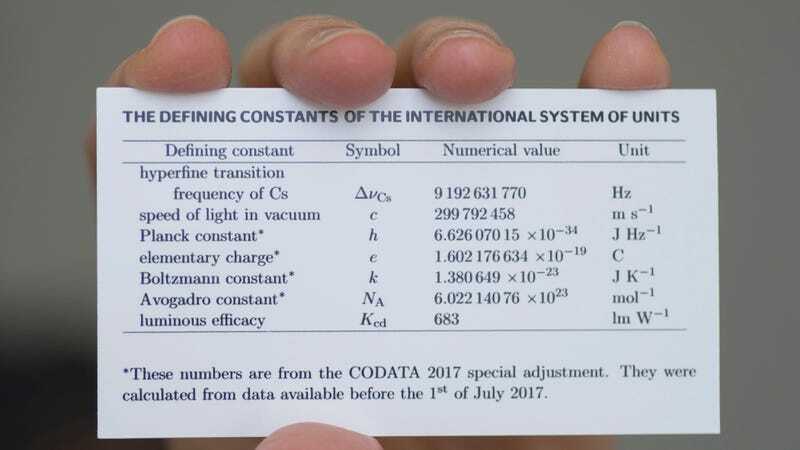 Other constants to be updated based on the fundamental constant updates including the kilogram, the kelvin, and the ampere according to a National Institute of Standards and Technology release.